I assumed that by running the Marquam Trail to Council Crest, the highest point in Portland, I would be making a picture when I reached the grand view at that historic spot. I did. 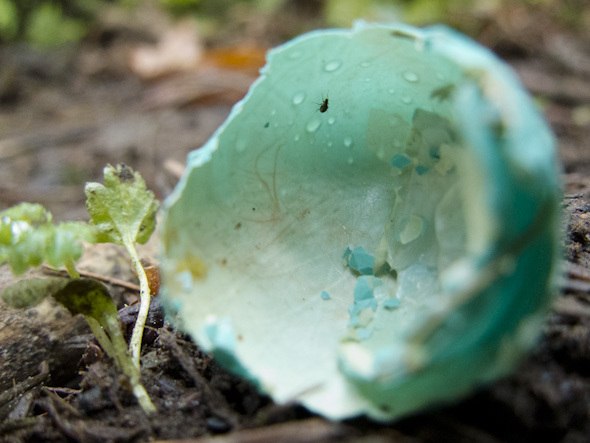 But it was this eggshell, from a robin I believe, that lay along my route that captured my imagination more than the view. As a kid, when I found these tiny shells on the ground each spring, I always pictured freshly hatched chicks squeaking in a nest nearby. But today, as I listened to the noisy jays high in the trees above me, it struck me that reality was no doubt quite different than what I’d been imagining all those years. This entry was posted on Wednesday, April 25th, 2012 at 10:21 pm. It is filed under Explore, running. You can follow any responses to this entry through the RSS 2.0 feed.